Many Indonesian meals consist of steamed or fried rice with side dishes of meat, chicken, fish, and vegetables. There is such a rich variety in the Indonesian cuisine that one should sample specialties in each region. However, most common nationwide are “sate” (skewered and grilled meat with peanut sauce on the side), “gado-gado” (vegetable salad with a peanut sauce), “nasi goreng” (fried rice), which often is served with every meal, and “bakmi goreng” (fried noodles). 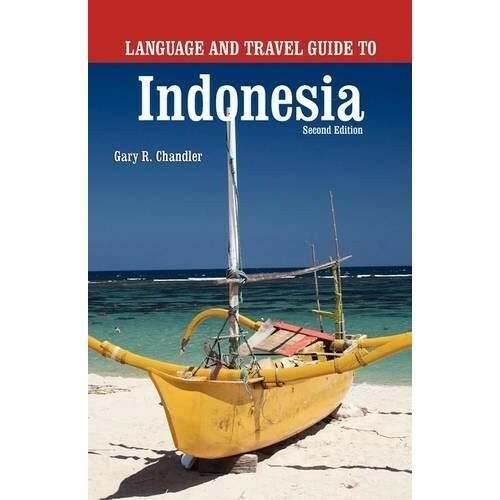 Indonesia has a very international menu available in most areas frequented by world travelers. Chinese restaurants are found throughout the country. There also are fine restaurants specializing in continental, Japanese, and Korean cuisines. Pizza, hamburgers, and sandwiches also are found in many restaurants and cafes. Unlike some countries in Asia, people in Indonesia don’t eat with chopsticks. They typically use a spoon in the right hand and a fork in the left hand. They eat with the spoon and use the fork to hold food down or load the spoon with the next bite. Most Indonesians like their food spiced with a hot chili sauce called sambal. It’s similar to the hot sauce used with Mexican food. It can be very hot, but it’s a common accent for rice, fish, and meat. Sometimes restaurants make it fresh and others buy it in bottles. Spices and hot chili peppers are the essence of most cooking, and in some areas they are used generously, such as in West Sumatra and North Sulawesi. In addition, peanut sauce is very common, especially with sate dishes. You also will find soy sauce available on most tables. Salt and pepper also are typically available for your personal flavoring. Each province or area has its own cuisine, with varied recipes and cooking styles. 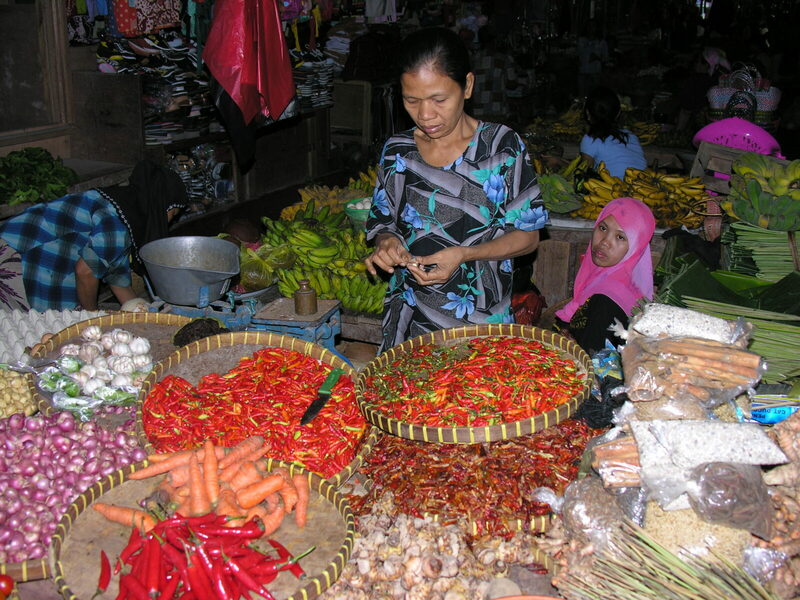 Common Javanese cuisines consist of vegetables, fruits, soybeans, beef, and chicken. They don’t eat as much fish as you might assume. The Sumatrans generally eat more beef compared to the other regions. West Sumatra is known for its Padang style restaurants, which can be found throughout Indonesia. Padang style often includes dried meat and fish and is spicier than most Indonesian dishes. 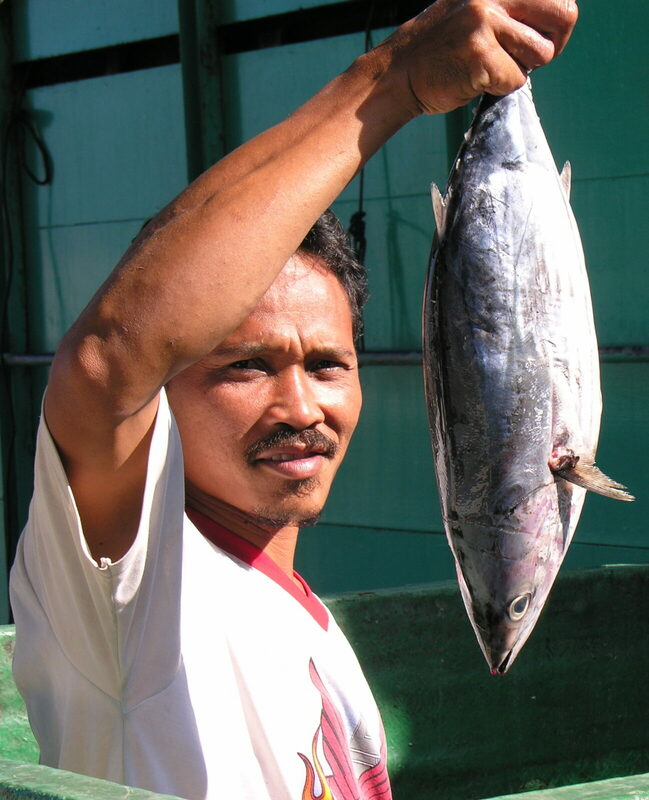 Further to the eastern side of Indonesia, including Bali, seafood is more of a staple in the daily diet. Grilled fish, shrimp, lobster, oysters, and calamari are commonly found on the menus. Various seafood soups also are common. In Bali, Papua, and the highlands of North Sumatra and North Sulawesi, pork dishes are specialties. As the population of Indonesia is predominantly Muslim (except Bali), pork is usually not served, except in Chinese restaurants, non-Muslim regions and in places serving international cuisine. Salad lovers have to be patient and careful. Green salads are not found at every restaurant, but fruit and vegetables abound. Larger restaurants, hotel restaurants, and international restaurants often have the green salads many world travelers crave. In these restaurants, the salads should be safe to eat, but smaller restaurants in smaller towns deserve a word of caution, because the salad may have been washed in tap water instead of distilled water. When this happens, the salad can make you sick. If the establishment has international patrons, it should be safe to eat the salads. 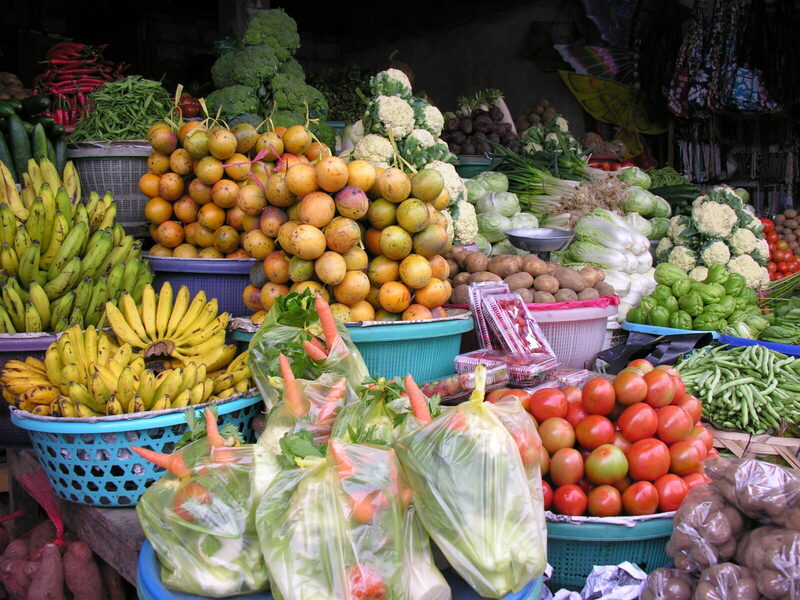 There is an abundance of tropical and sub-tropical fruits and vegetables available for consumption in Indonesia all year. Some fruits are seasonal, but most are available throughout the year, such as bananas, apples, papayas, pineapples, oranges, etc. Pure vegetarian dishes are available, but more limited and challenging to arrange in some areas. Most vegetarians are thrilled with the freshness and variety of the food available here. Most establishments are very accommodating. Beverages of every type are found throughout the country. The word for beverage is minum. The word for large is besar and the word for small is kecil. The word for hot is panas and the word for cold is dingin. Coffee and tea are among the many crops grown throughout the islands. It’s usually fresh and strong here. Kopi is the word for coffee and teh is the word for tea. They both are fairly strong. Kopi Jawa is Javanese style and unfiltered. It has powder-like coffee grounds in the bottom of the cup. Gula is the word for sugar, susu is the word for milk. Soft drinks from around the world are common here. Better yet, fresh juices, jus, from local produce also are available in most establishments. Fresh orange, grapefruit, melon, and other juices are rarely more than a few steps away. If you are in the mood for one of your traditional drinks, order it just as you normally would in your hometown. Most basic drinks and forms of alcohol seem to be part of a universal language. For instance, gin, vodka, rum and tequila are generally stocked and easily communicated in places that stock liquor. There are several breweries that produce local beer. Bali produces brem, which is a rice wine, whereas Toraja has tuak, which also is found in North Sumatra and other areas. In some cases, you don’t want ice in your drinks. However, most restaurants and hotels will have the ice that is safe to consume without getting sick. The alcohol in your drink might kill bacteria in the ice, but don’t count on it. Since many Indonesian people support their families with tips, it’s an important subject. Many hotels and restaurants add on 18 percent for taxes and service charges. When the tip is not automatically included, a good waiter or waitress deserves at least a 10 percent tip. Depending on the restaurant, you may want to actually hand the change directly to the person when you leave the establishment. That way the tip ends up in the right hands. I want = Saya mau _________. (SYE-ah MAH-oo ________). He/she wants _________. = Dia mau _________ (DEE-ah MAH-oo).